The bone augmentation procedure is usually accomplished by creating a secluded space between the residual alveolar process and the elevated flap, typically filled with autografts, allografts, xenografts, alloplasts, or combinations of different graft materials to maintain space for new bone formation. Several studies reported that factors such as volume of the graft material, the type of bone graft, and the amount of autogenous bone, could affect the amount of new bone formation, and most of these studies have shown a correlation between the success of the bone graft and the success of dental implants. Anorganic bovine bone matrix is a bone substitute manufactured from bovine bone that has been processed and sterilized for use in intraoral grafting procedures. The mineral phase of the bone consists mainly of hydroxyapatite, which has been substituted by carbonate, sodium, magnesium, and fluoride ions; hence, the calcium (Ca) and phosphorus (P) concentrations in bone mineral may not correspond to those of pure stoichiometric hydroxyapatite (Ca/P ratio of 1.667 atomic percentage). Recently published systematic reviews, concluded that the results of sinus augmentations with xenografts are the most complete and well documented in the published peer-reviewed literature. Moreover, it was reported that anorganic bovine bone promoted osteogenesis and showed very low resorbability. It was demonstrated that osteoblasts on the calcium-phosphate thin film exhibit a high cellular activity such as adhesion, proliferation, and differentiation with the formation of calcified matrix. Recently, a new natural bovine bone grafting material with incorporated Type I atelocollagen has been introduced for the use in implant dentistry. It has been used for the permanent filling or reconstruction of bone defects in orthopedic surgery and traumatology as well as in implantology, periodontology, and maxillofacial and dental surgery. The atelocollagen seems to improve the graft capability of cells differentiation (from mesenchymal osteoprogenitor stem cells into osteoblasts) and to be able to enhance the proliferation rate of osteoblasts when used in association with a scaffold of natural hydroxyapatite. An in vivo animal study demonstrated, in fact, that atelocollagen coating was noncytotoxic and was able to improve cell proliferation, adhesion, and osteogenic activity in respect with the same grafting material without the atelocollagen coating. The aim of the present study was to compare the regenerated tissue, in artificial mandibular bone defects, between the spontaneous healing (starting from the blood clot only) and the use of a novel natural bovine bone graft with integrated atelocollagen Type I. The atelocollagen Type I could be incorporated in may grafting materials to improve bone formation rate. The study design included a histologic and histomorphometric evaluation in sheep. The Ethics Committee for Animal Research of the Veterinary School of the University of Teramo (Teramo, Italy) approved the study protocol, which followed guidelines established by the European Union Council Directive of February 2013 (R.D.53/2013). Four hollow titanium cylinders, termed “bone growing chambers” (BGC), were prepared by commercially pure titanium. The dimensions of the BGCs, used in this study, were 4.0-mm internal diameter and 8-mm length. The cylinders were made of commercially pure titanium Grade 4. The internal as well as the external of the titanium cylinders were sandblasted and acid-etched surfaces. In the walls of the cylinders, a number of large holes, 2 mm in diameter, were created to allow bone ingrowth from the lateral bone surfaces. The upper and the lower end of the hollow cylinder were opened to allow bone ingrowth from the apical bone and the periosteum. Two female sheep aged 4–5-year-old were randomly selected. The clinical examination determined that all animals were in good general health. Exclusion criteria included general contraindications (pregnancy and systemic disease) to implant surgery and active infection, or severe inflammation in the area intended for implant placement. The animals were given thiopental (Thiopental, Hoechst, Austria) for induction of anesthesia as needed. After orotracheal intubation and ventilation, anesthesia was sustained with nitrous oxide-oxygen with 0.5% halothane. Physiologic saline was administered for fluid replacement. The inferior edges of the mandible were exposed through a skin incision of 15 cm in length. The skin and facial layers were opened and closed separately. 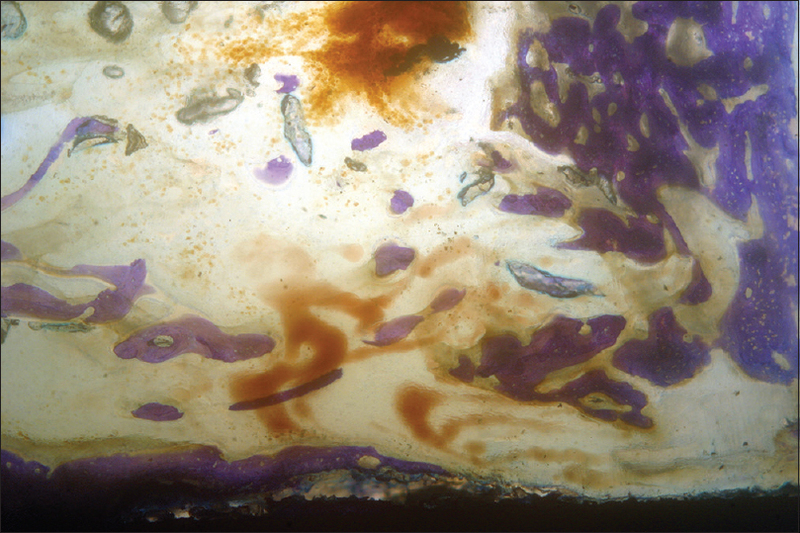 After dissection of the soft tissues exposing the bone edge, one BGC site was prepared in each (left and right) side of the mandibular inferior edge of each animal using standard drilling sequence under saline solution irrigation. One surgeon placed all titanium chambers. The drilling speed was set at 1000 rpm for all groups. In each animal, the right BGC was filled by the novel natural bovine bone graft with integrated atelocollagen Type I (provided by Mallivento S.r.l., Bologna, Italy), while the left BGC was left empty to be filled by blood clot. In addition, in each animal were prepared eight osteotomic sites (four in the left and four in the right mandible) 4 mm in diameter and 8 mm in length. Four holes, in each animal, were filled by the test material and the others four were left empty. In a separate register position, data were reported (animal number, mandible side, and mesial or distal position) to recognize implant group membership. Surgical wounds were closed, both in the mandible, by a resorbable periosteal-muscular inner suture followed by a cutaneous silk 2-0 external suture. Each animal underwent an antibiotic systemic therapy for 5 days with 8 ml of long-acting Clamoxyl (Pfizer Limited, Sandwich, USA). The sheep were sacrificed 2 months after implantation and by an overdose of pentothal sodium (Thiopental; Hoechst, Austria). The healing time was selected because many histologic studies,,, in sheep demonstrated that after 2 months, of surgical wound in these animals, the bone callus has been formed and the remodeling process is starting. The specimens were immediately fixed in 10% neutral buffered formalin. After dehydration, the specimens were infiltrated with a methyl methacrylate resin from a starting solution 50% ethanol/resin and subsequently 100% resin, with each step lasting 24 h. After polymerization, the blocks were sectioned and then ground down to about 40 μ. Toluidine blue staining was used to analyze the different ages and remodeling pattern of the bone. 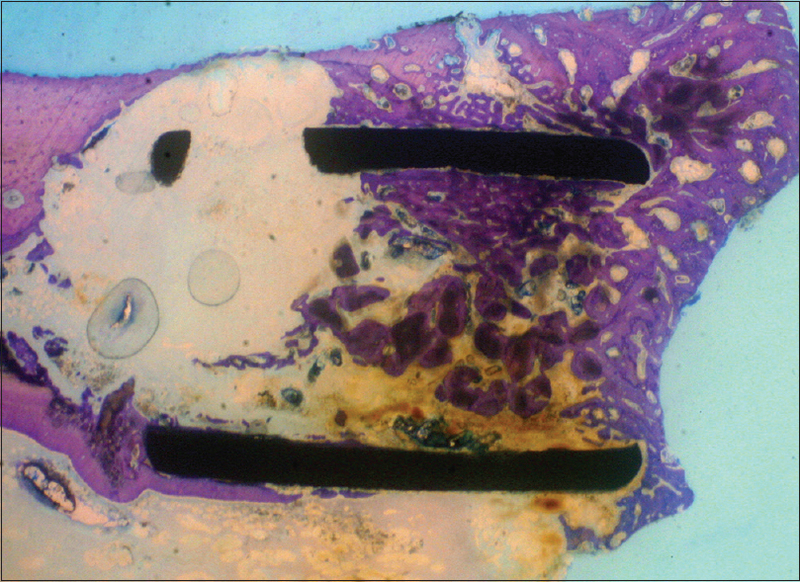 The histomorphometric analysis was performed by digitizing the images from the microscope through a JVC TK-C1380 Color Video Camera (JVC Victor Company, Yokohama, Japan) and a frame grabber. The images were acquired with a ×10 objective including the entire implant surface. Subsequently, the digitized images were analyzed by the image analysis software IAS 2000 (Delta Sistemi, Roma, Italy). For each section, the two most central sections were analyzed and morphometrically measured. The histomorphometric parameters calculated using the software were the bone volume percentage (BV%) (bone and graft inside the chamber), % graft volume (how much residual graft is found inside the chamber), and % vital bone (newly formed bone inside the chamber). A nonparametric Mann–Whitney test was applied to test the statistical differences between the different groups using the statistical software GraphPad Prism 5 (www.graphpad.com). All the BGCs were integrated into the mandibular bone after 2 months of healing. At the surgical reentry (sheep sacrifice), the BGCs were visible on the crest mandible and easy to distinguish from the surrounding bone. Stable BGCs demonstrated the presence of bone tissue inside the hollow space. A healthy pattern of bone repair process was detected around and inside the chambers. A small amount of bone penetration inside the regenerating space was found in the empty BGCs [Figure 1]. The holes without titanium BGCs were not visible on the healed cortical crest and X-rays were needed to find them. In empty BGCs and holes (control group), the bone inside the chambers showed the aspects of spongy bone with a mix of woven and lamellar bone (composite bone). 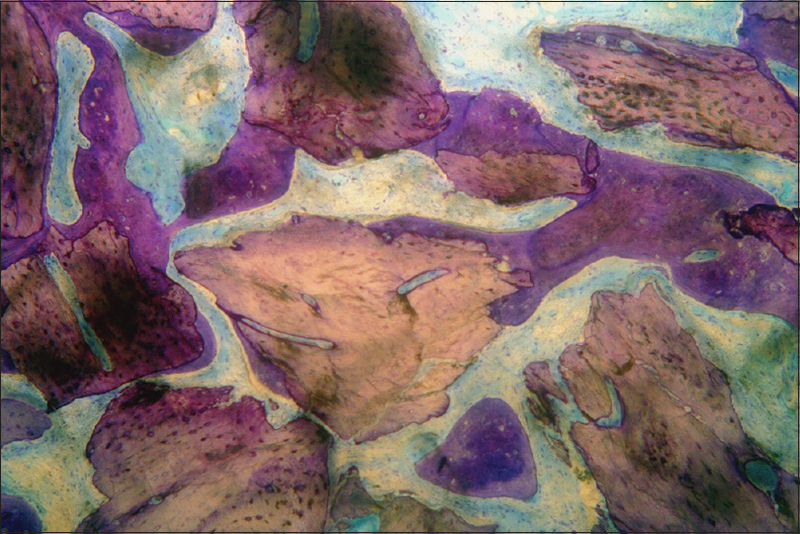 The mineralized matrix of this regenerated bone was mainly composed by composite bone made of woven bone in the inner core of the trabeculae, whit numerous and rounded large osteocytes and external layers of the regenerated trabeculae composed of paralleled fibered bone [Figure 2]. The bone trabeculae were growing from the lateral and lower holes inside the regenerating space and tended to converge together. The upper edge of the chamber was filled by more dense bone with the tendency to regenerate the cortical layer. The bone marrow of the regenerating spaces showed the aspect of fibrous tissue with few vascular canals with low inflammatory reaction. In BGCs filled with the grafting material (test group), the formation of a more compact bone structure was evident and composed of newly formed bone mixed with grafted granules almost completely incorporated in the new trabeculae of the newly formed bone [Figure 3]. At the level of the outermost periosteal surface, close to the osteotomic hole, the bone was more compact with a tendency to reconstitute the cortical integrity [Figure 4]. Close to the deepest area, in correspondence of the central neurovascular canal of the mandible, bone density decreased while maintaining a considerable thickness of the bone trabeculae in relation to the size of the granules [Figure 5]. In most of the cases observed, it was difficult to distinguish grafted granules from the newly formed bone. In few areas, in which the granules are in contact with the medullary tissues, resorption of the granules was observed. The histomorphometric analysis revealed a total BV% of 52.01 ± 8.62 for the test group and 33.72 ± 18.18 for the control group. A residual graft granules percentage of 9.02 ± 4.60% was found in the test group. The mean percentage values for newly formed bone were 43.01 ± 9.67 for the test group and 33.72 ± 18.18 for the control group. All data were summarized in [Table 1] and [Table 2]. The statistical comparison between mean percentage values of total bone volume (BV%) revealed significant difference between the two groups (P < 0.05). No significant difference was detected (P > 0.05) between test and control groups in newly bone formation percentages. The aim of the present study was to compare the regenerated tissue, in artificial mandibular bone defects, between the spontaneous healing (starting from the blood clot only) and the use of a novel natural bovine bone graft with integrated atelocollagen Type I. The present paper confirmed that artificial bone defects with four walls (4 mm in diameter and 8 mm in length) in animal mandible may heal in 2 months without using any graft material or membrane. 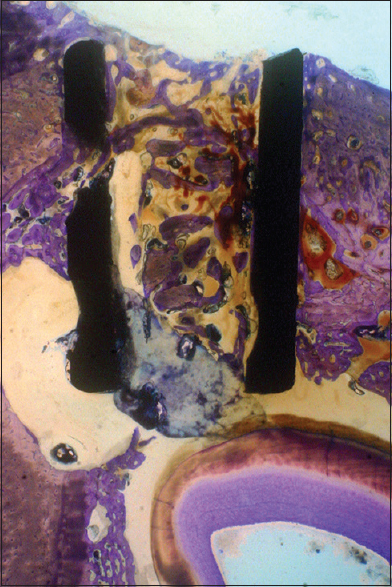 However, the bone spontaneous healing by the natural stabilization of initial blood clot and osteoblast proliferation, without any material that could mechanical support (scaffold function) cell migration and organization, could result in a weak tissue with large medullary spaces and only few bone trabeculae. This type of tissue could not be ideal for support strong mechanical stress such as masticatory load in implant-supported rehabilitation. The ideal biomaterial for supporting bone regeneration would maintain the space exactly for the time needing for new bone formation and being progressively resorbed. The currently available bone substitutes provide only osteoconduction as a scaffold but not osteoinduction and bioabsorption of residual bone substitute material and volume maintenance of the augmented bone are inversely related. The results of the present study clearly showed that the bovine hydroxyapatite scaffold material with the incorporation of atelocollagen Type 1 could support the bone regeneration in bone defects in animals. The mean value of newly formed bone was about 25% higher defects filled with the graft in respect with those left empty (filled only by blood clot), although there was a high variability between the samples within the two groups (testified by high standard deviations). This high osteoconductivity could be ascribed to the incorporation to the hydroxyapatite granules of atelocollagen Type 1. It is a specifically modified type of collagen I that has been freed from immunogenic telopeptides. The chemical process of freeze-drying removes water from the material by sublimation that converts ice to water vapor without passing through any intermediary phase. Thanks to the atelopeptidation (performed within the bone granules and) and lyophilization treatment (nonheated), this new porous graft material seems to have many advantages such as high biocompatibility, low inflammatory host response, promotion of wound healing, release of clotting, and growth factors (insulin-like growth factor [IGF] 1, transforming growth factor [TGF], platelet-derived growth factor) from thrombocytes. Each granule consists of approximately 30% atelocollagen (collagen Type I free of telopeptide with native osteoinductive elements, such as TGF, bone morphogenetic proteins, and IGFs) and 70% bovine-derived hydroxyapatite. Furthermore, Fujioka-Kobayashi et al. demonstrated that hydroxyapatite particles with the incorporation of atelocollagen Type I contained many more visible collagen fibrils throughout the scaffold surface and improved growth factor adsorption and osteoblast proliferation. The results from the present in vivo evaluation agreed with many studies that demonstrated that the use of scaffold in bone regenerative dentistry ensured better outcomes, in term of bone volume amount and newly formed bone, than the only blood clot. Data indicated that atelocollagen Type 1 may be potentially used as a coating for bone substitutes to enable effective bone regeneration. The present study represented a first step for studying atelocollagen Type 1 potential in bone regeneration. Future studies are needed to compare bone grafting material without atelocollagen Type 1 to grafting material with atelocollagen Type 1 incorporated. Furthermore, studies with long follow-up are need to evaluate regenerated tissue properties over the time. The authors wish to thank Mallivento S.r.l. (Via P. F. M. Grimaldi, 5 - 40122 Bologna, Italy) for providing the grafting material used in the present study. The authors declare that they have not received any grant of financial support for the present study. The authors reported no conflicts of interest related to this study. Buser D, Brägger U, Lang NP, Nyman S. Regeneration and enlargement of jaw bone using guided tissue regeneration. Clin Oral Implants Res 1990;1:22-32. Esposito M, Grusovin MG, Felice P, Karatzopoulos G, Worthington HV, Coulthard P, et al. The efficacy of horizontal and vertical bone augmentation procedures for dental implants-a cochrane systematic review. Eur J Oral Implantol 2009;2:167-84. Jensen SS, Terheyden H. Bone augmentation procedures in localized defects in the alveolar ridge: Clinical results with different bone grafts and bone-substitute materials. Int J Oral Maxillofac Implants 2009;24 Suppl: 218-36. Nam JW, Khureltogtokh S, Choi HM, Lee AR, Park YB, Kim HJ, et al. Randomised controlled clinical trial of augmentation of the alveolar ridge using recombinant human bone morphogenetic protein 2 with hydroxyapatite and bovine-derived xenografts: Comparison of changes in volume. Br J Oral Maxillofac Surg 2017;55:822-9. Serrano Méndez CA, Lang NP, Caneva M, Ramírez Lemus G, Mora Solano G, Botticelli D, et al. Comparison of allografts and xenografts used for alveolar ridge preservation. A clinical and histomorphometric RCT in humans. Clin Implant Dent Relat Res 2017;19:608-15. Meloni SM, Jovanovic SA, Urban I, Canullo L, Pisano M, Tallarico M, et al. Horizontal ridge augmentation using GBR with a native collagen membrane and 1:1 ratio of particulated xenograft and autologous bone: A 1-year prospective clinical study. Clin Implant Dent Relat Res 2017;19:38-45. Meloni SM, Jovanovic SA, Lolli FM, Cassisa C, De Riu G, Pisano M, et al. Grafting after sinus lift with anorganic bovine bone alone compared with 50:50 anorganic bovine bone and autologous bone: Results of a pilot randomised trial at one year. Br J Oral Maxillofac Surg 2015;53:436-41. Starch-Jensen T, Aludden H, Hallman M, Dahlin C, Christensen AE, Mordenfeld A, et al. A systematic review and meta-analysis of long-term studies (five or more years) assessing maxillary sinus floor augmentation. Int J Oral Maxillofac Surg 2018;47:103-16. Danesh-Sani SA, Engebretson SP, Janal MN. Histomorphometric results of different grafting materials and effect of healing time on bone maturation after sinus floor augmentation: A systematic review and meta-analysis. J Periodontal Res 2017;52:301-12. Degidi M, Perrotti V, Piattelli A, Iezzi G. Eight-year results of site retention of anorganic bovine bone and anorganic bovine matrix. J Oral Implantol 2013;39:727-32. Reitmaier S, Kovtun A, Schuelke J, Kanter B, Lemm M, Hoess A, et al. Strontium (II) and mechanical loading additively augment bone formation in calcium phosphate scaffolds. J Orthop Res 2018;36:106-17. Kim BS, Yang SS, Lee J. Precoating of biphasic calcium phosphate bone substitute with atelocollagen enhances bone regeneration through stimulation of osteoclast activation and angiogenesis. J Biomed Mater Res A 2017;105:1446-56. Trisi P, Berardini M, Falco A, Sandrini E, Vulpiani MP. A new highly hydrophilic electrochemical implant titanium surface: A Histological and biomechanical in vivo study. Implant Dent 2017;26:429-37. 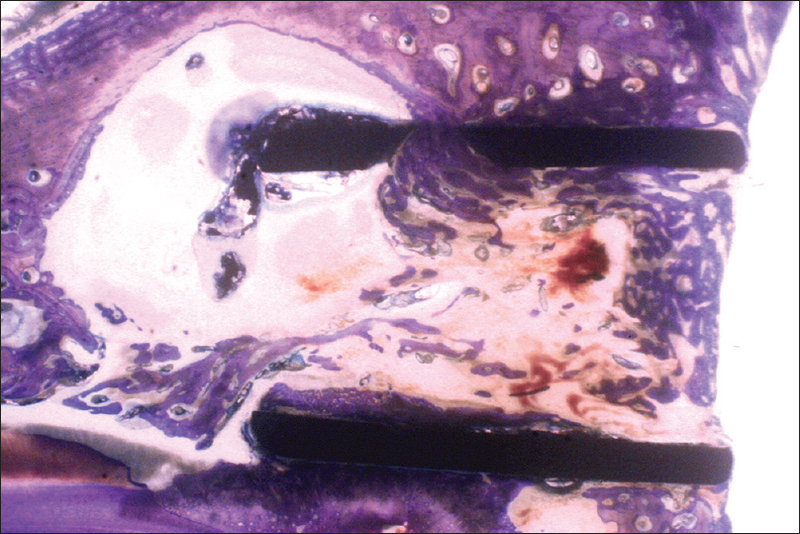 Trisi P, Berardini M, Falco A, Podaliri Vulpiani M, Perfetti G. Insufficient irrigation induces peri-implant bone resorption: An in vivo histologic analysis in sheep. Clin Oral Implants Res 2014;25:696-701. Trisi P, Berardini M, Colagiovanni M, Berardi D, Perfetti G. Laser-treated titanium implants: An in vivo histomorphometric and biomechanical analysis. Implant Dent 2016;25:575-80. Yamada M, Egusa H. Current bone substitutes for implant dentistry. J Prosthodont Res 2018;62:152-61. Fujioka-Kobayashi M, Schaller B, Saulacic N, Zhang Y, Miron RJ. Growth factor delivery of BMP9 using a novel natural bovine bone graft with integrated atelo-collagen Type I: Biosynthesis, characterization, and cell behavior. J Biomed Mater Res A 2017;105:408-18.